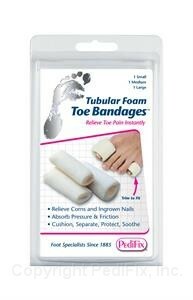 Soft foam tubes absorb pressure and friction to cushion and separate toes that rub. Relieve corns, ingrown nails and other irritations. Fit comfortably in most footwear. Scissor trimmable for a custom fit. Each package contains three 3-inch long bandages. Mix contains 1 S, 1 M, 1 L. Small, Medium & Large contain 3 per pack.